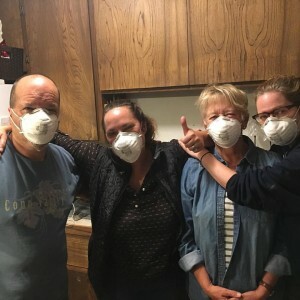 The Wine Country Wildfire “Burnt Toast BnB” Crew surviving- with masks on. L to Right, John Egerman, Alison Crowe, my mom Sandy Crowe and sister Jennifer Crowe. Wearing our “N95” anti-smoke masks! My parents were just up here in Napa helping Chris and I prepare to evacuate during the October Wine Country Wildfires and now they are facing a similar situation at home. As the Thomas Fire creeps closer to Carpinteria, California, the idyllic little beach town where I grew up, my heart goes out to all my friends and family in the area. There’s not much I can do from hundreds of miles away, besides post current fire maps on Facebook and try to be a communication bridge from afar. However, I can at least compile a list of lessons and “to do’s” I learned during the Wine Country Wildfires of October 2017. -Make a list of “To Do’s” and “To Pack’s”. Stress makes for forgetful minds and writing it down will add to your sanity and calm. -Know your escape routes and keep posted on if and when they might get pinched off. Have a backup escape plan (or two). -Pre-arrange a rendezvous point out of the area post-evacuation in case you get separated on the drive away from your house (if you’re taking more than one vehicle). That way you’ll know immediately if everyone made it out OK.
-If you haven’t already, sign up for local alert systems like Nixle. -Turn on local radio channels. We listened to Napa’s KVYN 99.3 a lot. -Be wary of false or rumored information on social media. Do verbal or messaging check ins with people to confirm information. -Find all your animals immediately. So many people got delayed chasing down scared cats or dogs. -Evacuate little kids early if possible, as early as possible. It will be far less traumatic for them watching from Grandma’s than seeing your scared faces and listening to the stressful grownup conversations. -If you choose to wear a mask or respirator (highly recommended) make sure it’s labeled “NIOSH-Approved” or marked “N95” or “P100”. Simple dust masks only trap large particles and the smaller smoke particles can still damage your lungs. -Open your garage doors. In the event of a power outage, it’s difficult to open electric garage doors. -Pack essentials….and only the essentials. Do the critical stuff first (passports, clothes, medicine, phones, chargers, batteries, food, water, pets and pet food) and then pack up some extra boxes later only if you have time (like your jewelry box, the wedding silver etc). This is where a prioritized “To Do” list is important. -Be prepared for the power to go out at any time. -Snap pictures of every room in your house and anything valuable in the yard or outbuildings for insurance purposes. -Remember that vineyards, orchards and green space make great firebreaks. – If you have well-irrigated fields, orchards, or vineyards, consider moving cars, boats or RV’s into the middle if you can’t evacuate all of your vehicles. This saved a lot of vehicles during the wine country fires. -If it’s coming soon and there’s nothing you can do, turn on the irrigation. Green lawns and plants will help keep fire away from the house. -If you have a pool and a pump, you’ve got a great source of water to irrigate your roof and property. -Turn off your gas when you leave. -Prepare as early as possible. -Pack an “immediate” go bag and keep it by your front door. -Take out cash, preferably in smaller bills, and keep some in your cars and in your “go” bag. -Fill all vehicle gas tanks. -Park your vehicles with the nose pointed out. -Put a flashlight in all vehicles in case you have to evacuate at night. -Know how to open your garage doors in the absence of electricity. Normally there is a hand-pull mechanism. I’m constantly surprised at the number of times I heard that people had delays getting out because they couldn’t get their garage doors open. -Sleep with shoes beside your bed in case you have to get out fast in the middle of the night. -Keep a flashlight with fresh batteries by your bed. -Save key electronic documents to the cloud in case you don’t have time to pack your computer. -Move all woodpiles, wooden patio furniture or other moveable burnables away from the house. -Be careful and watch for announcements- you may have to boil your water if power goes down and water treatment plants are not able to operate. -Put sprinklers on your roof. -If you have a pool, go and find a “Billy Pump” water pump like this if you don’t have one already. Get one soon; they’ll go fast at Home Depot and Wal Mart. -Get out your earthquake/disaster kit, go through it, make sure your supplies are fresh and current. Shop for items you need to replace. -If you have time, pack up some sentimental boxes of things you know you’d miss if your house burned down. We packed original artwork, kids art projects, antiques and other irreplaceable family heirlooms. -Be a good neighbor and open your home to evacuees. We did and John (see picture above) was a tremendous help during the two weeks of fires here in Napa. -If you have the space, offer up your driveway or property for boat or RV storage for evacuees. -Volunteer at the Red Cross, Salvation Army or shelter. -Buy air filters and masks as early as you can; they will quickly run out at area stores. Have out of town friends bring them if they come to help, order them from Amazon if you can still get delivery to your house. -Invest in a portable USB battery so you can charge your phone if the power goes out. -You may think the fire won’t come your way; act like it will.